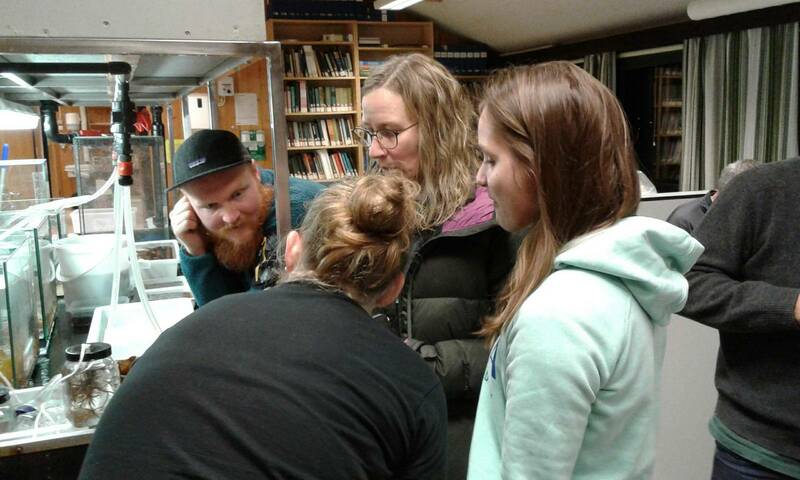 The final week of March was teeming with activity, as no less than three Norwegian Taxonomy Projects (Artsprosjekt) from the Invertebrate Collections arranged a workshop and fieldwork in the University of Bergen’s Marine biological field station in Espegrend. 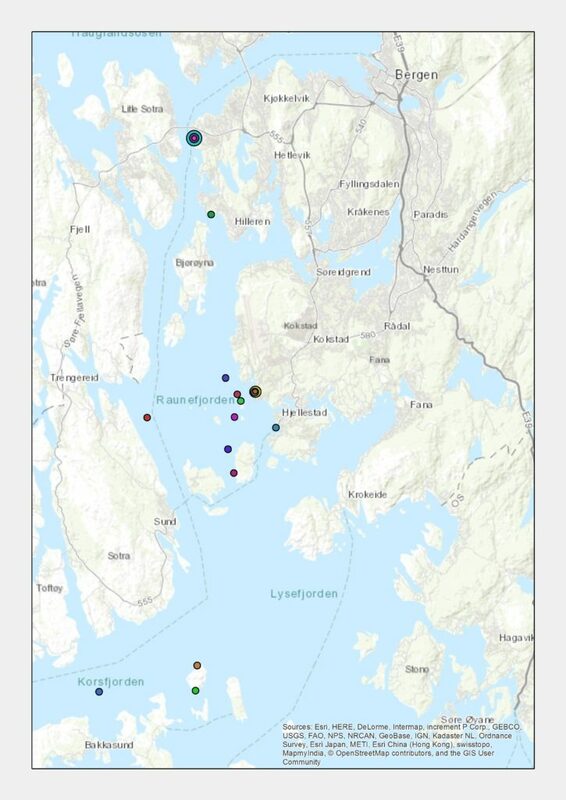 The projects – Sea Slugs of Southern Norway(SSoSN), Norwegian Hydrozoa (NorHydro) and Invertebrate fauna of marine rocky shallow-water habitats: species mapping and DNA barcoding (Hardbunnfauna) fortunately overlap quite a bit in where and how we find our animals (as in, Cessa’s seaslugs are eating the organisms the rest of us are studying..! ), and so it made sense that we collaborated closely during this event. 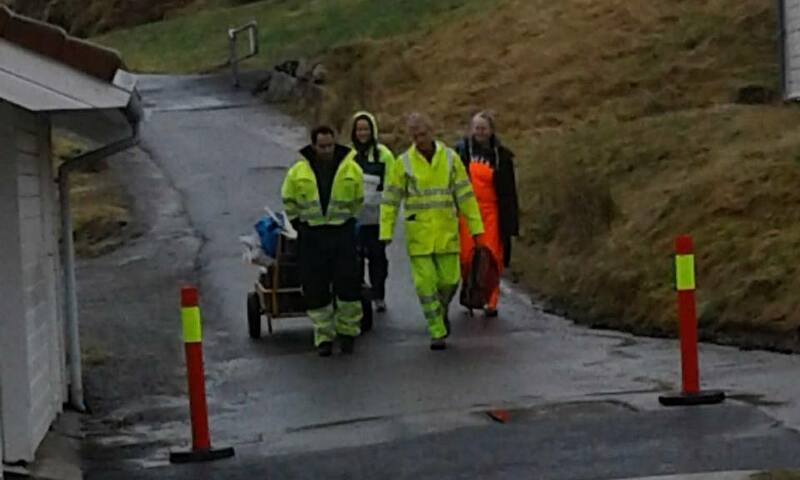 That meant more hands available to do the work, more knowledge to be shared – and definitely more fun! All projects had invited guests, mostly specialists in certain groups, but also citizen scientists, and our students participating. 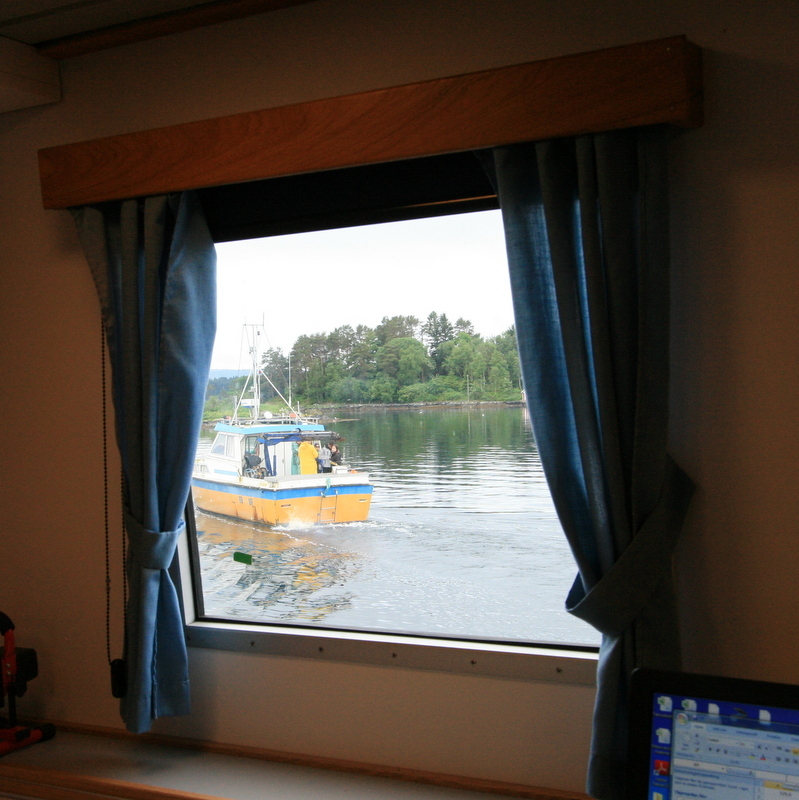 We stayed at the field station, which has excellent facilities for both lodging and lab work. 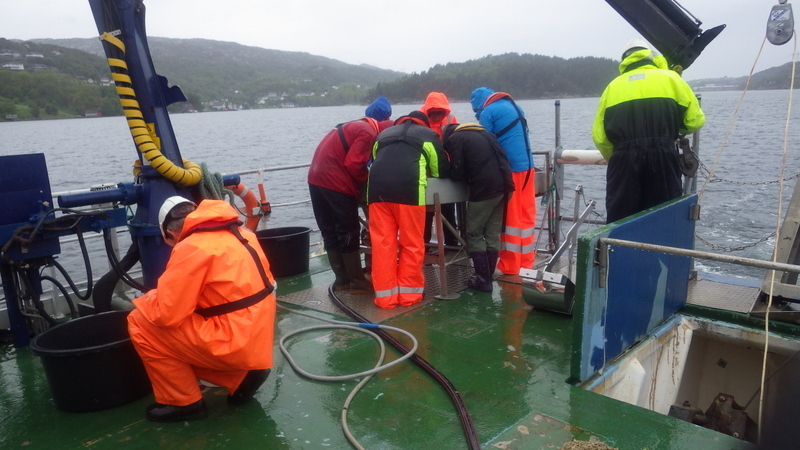 The fieldwork was carried out in the Bergen region, and was done in various ways. 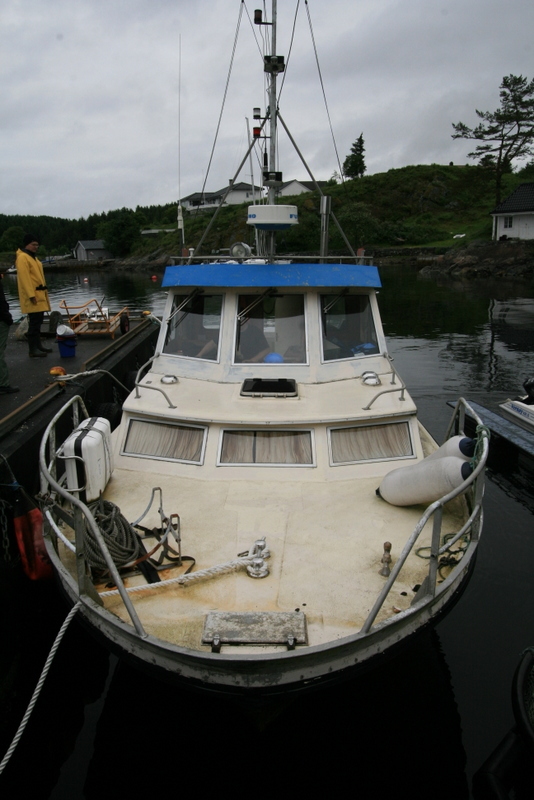 We had the R/V “Hans Brattstrøm” available for two days, where we were able to use triangular dredges, plankton net, and grab to sample. 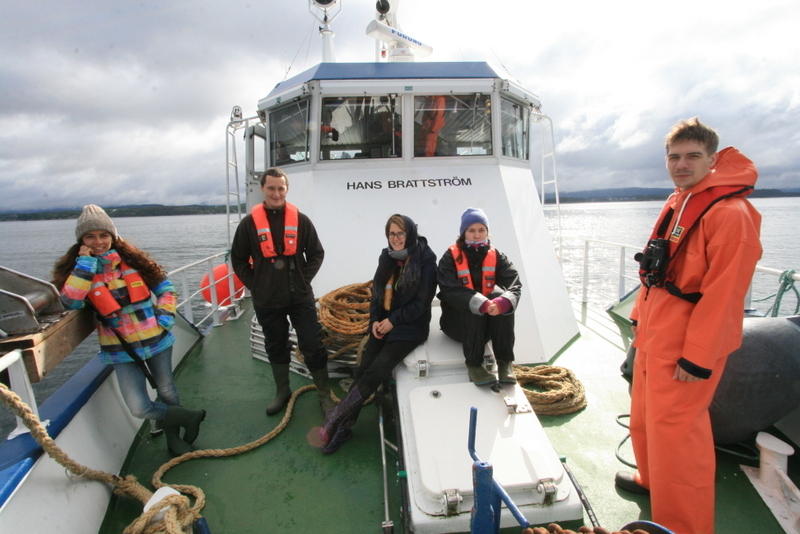 Other days we used a small boat from the station to go to the islands close to Espegrend to examine the tide pools and tidal belt. 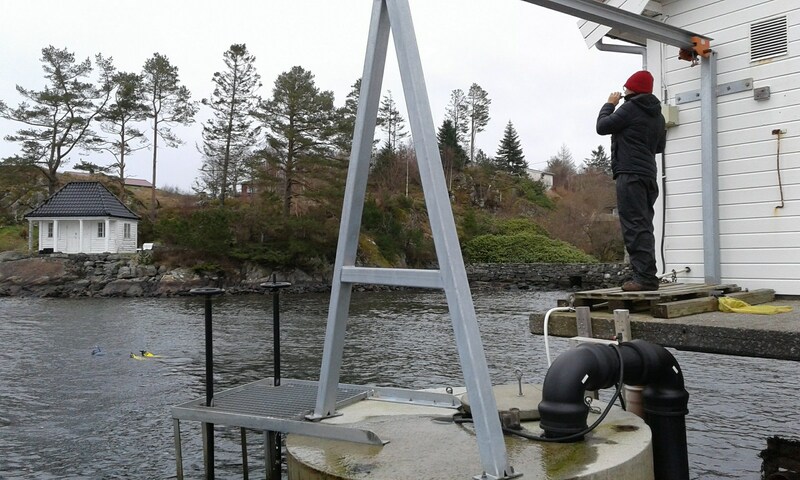 We also went to local marinas and scraped off what was living on the piers, and a brave soul donned her wet suit and went snorkeling, which enabled us to sample very specific points of interest (“take that green thing over there!”). We are fortunate here in Bergen in that we have a very active local student dive club, SUB-BSI, whose divers kindly kept an eye out for – and even collected – some of our target animals, as well as sharing their photos of the animals in their natural habitat, all of which is amazing for our projects! 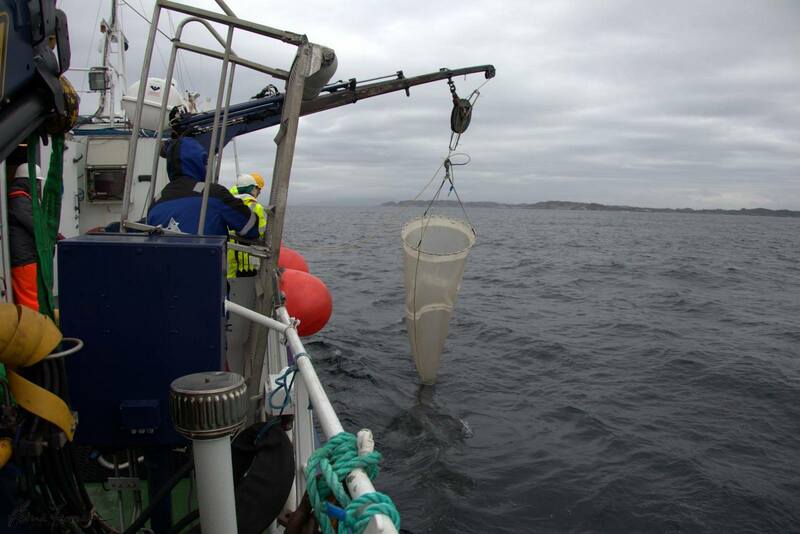 We gave short presentations of each of the projects at SUB in the beginning of the week, and invited the divers out to the lab to on the following Thursday to show some of the things we are working on. 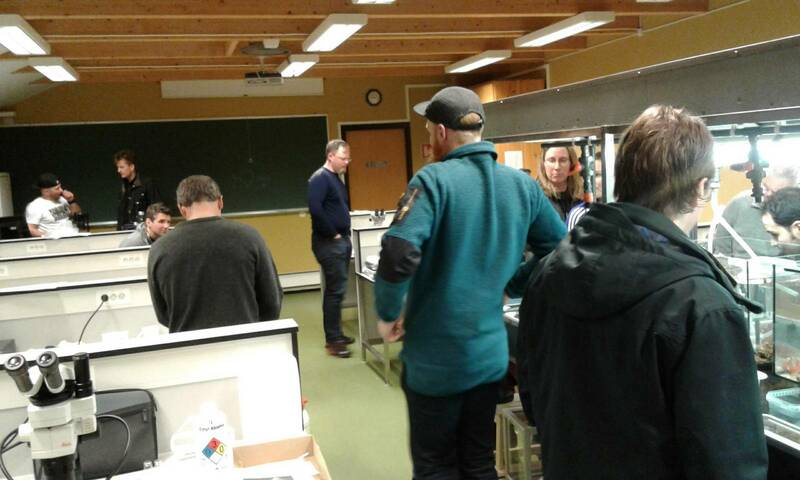 It was a very nice evening, with a lot of interested people coming out to look at our critters in the lab. We also decimated no less than 14 homemade pizzas during that evening – learning new stuff is hard work! 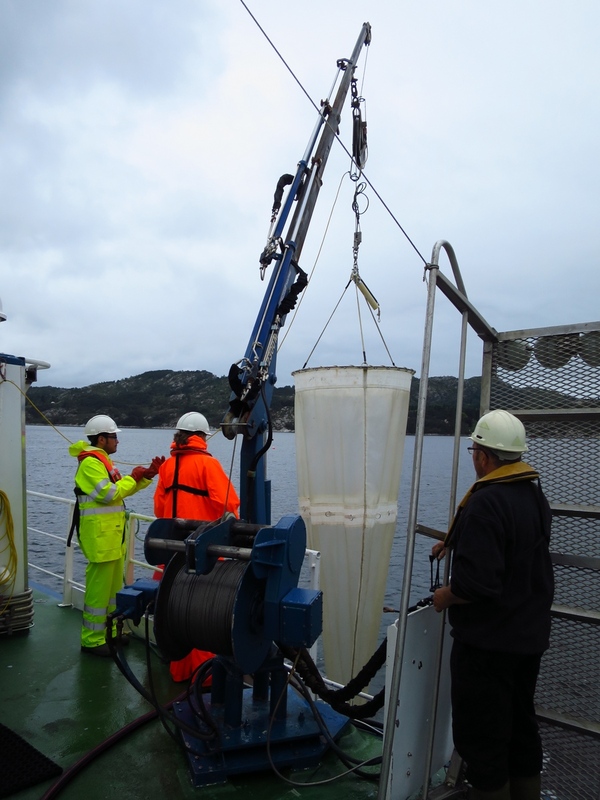 All together, this made it possible for us to get material from an impressive number of sites; 20 stations were sampled, and we are now working on processing the samples. 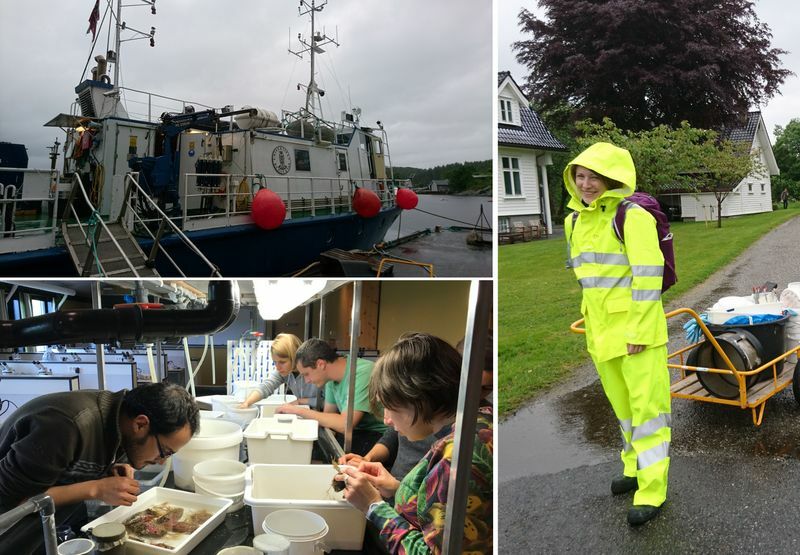 We are very grateful to all our participants and helpers for making this a productive and fun week, and we’ll make more blog posts detailing what each project found – keep an eye out for those! 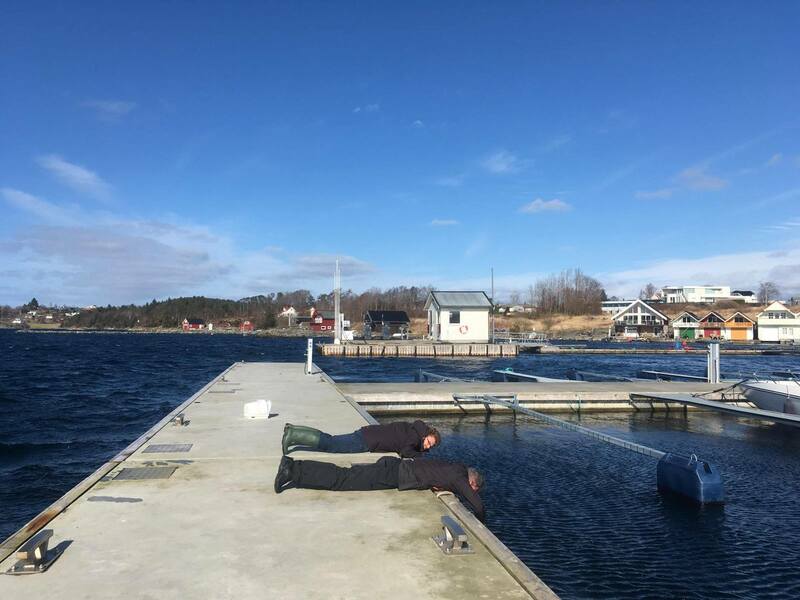 This entry was posted in Current projects, DNA barcode, Field work, Guests, Hardbunnsfauna, NorBOL, NorHydro, Norwegian Taxonomy Initiative, Photography, Sea slugs of Southern Norway (SSoSN) on April 5, 2019 by katrine. Joan, ready to go jelly-hunting under the blue sky! Imagine a caterpillar and its butterfly described as different species by the scientific community. Now think on how confusing it would be if everybody kept calling them with different names over centuries. 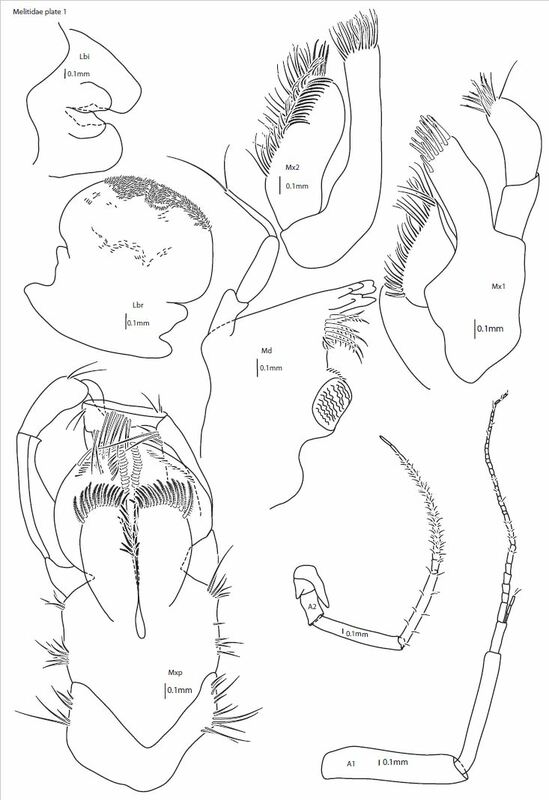 Well, this is the case of many hydroids and their corresponding medusae! Hydrozoans, together with other well-known animals such as corals, anemones and jellyfishes, are included within the Phylum Cnidaria. 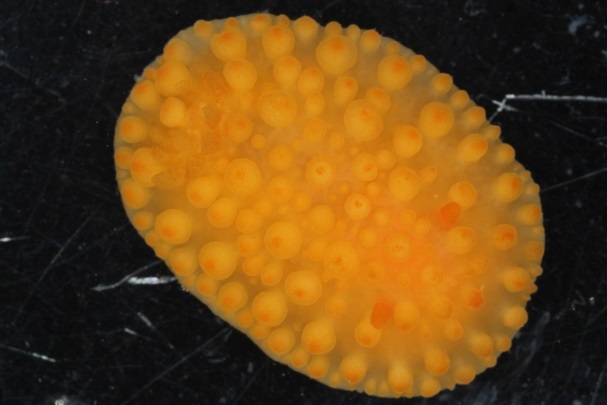 Most hydrozoans are metagenetic, which means that they alternate between asexual (the polyp, usually benthic) and sexual (medusae, usually pelagic) stages in their life. Since the early works by Linnaeus in the mid-18th century, the very first scientists who showed interest in hydrozoans specialized primarily in a single stage of their life cycle, often neglecting the other, and even those courageous scientists who accepted the challenge of studying both groups were unable to discover the correspondence between such different animals as the polyp and the medusa. 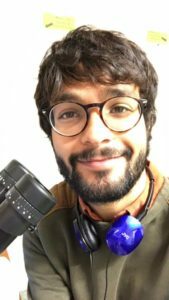 Nowadays, in the era of molecular tools, new techniques are revealing that things are not what they seem, neither do they look like what they really are. Thanks to project HYPNO, several links between polyps and medusae have been found, with the subsequent adjustment in their ID (a.k.a. 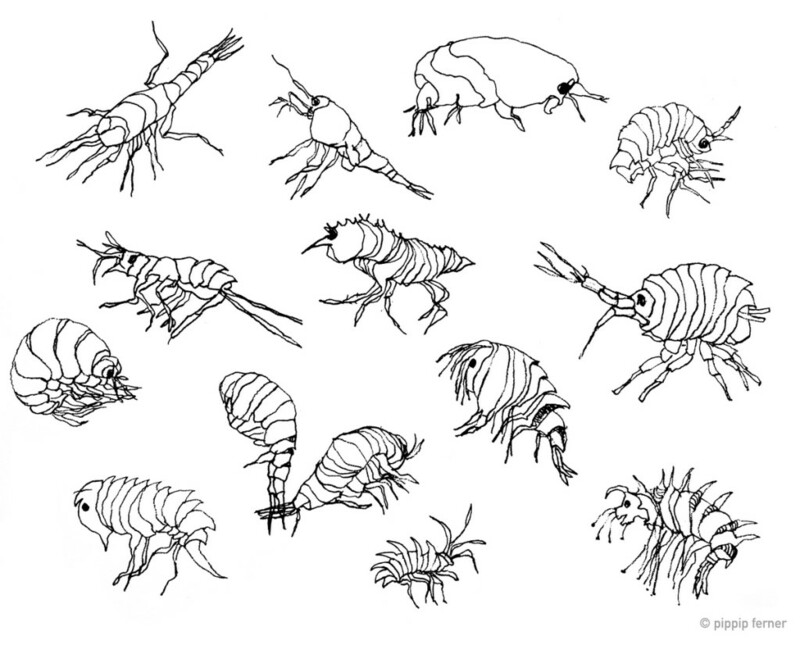 their scientific name), but that is not all! 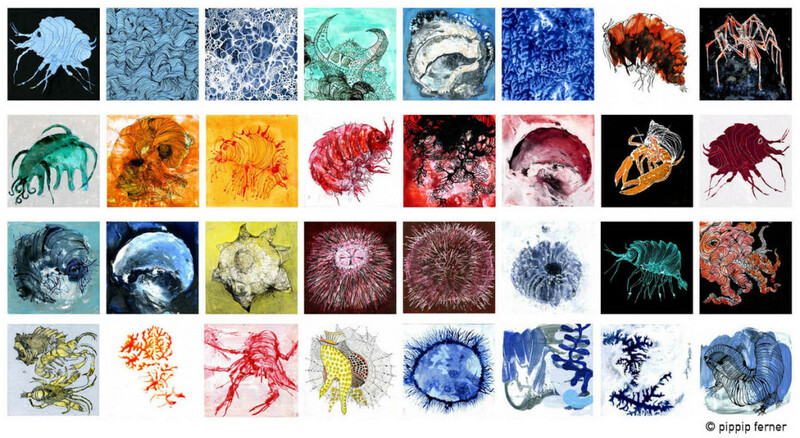 New evidences are bringing to light that some hydrozoans, even if they are morphologically identical to each other, in reality belong to different species, a fact known as “cryptic species”. 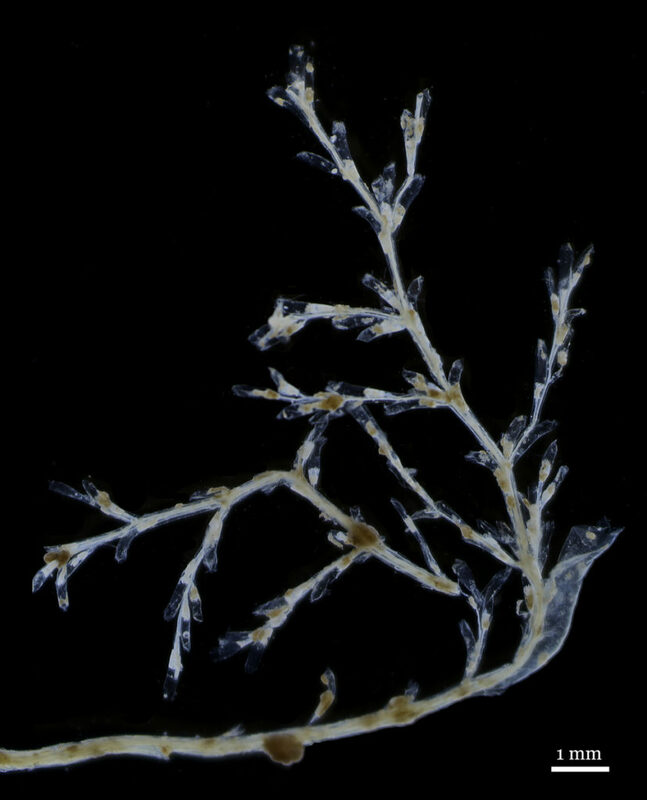 Hydroids of Stegopoma plicatile (like this one) from all over the world look very similar to each other, but may produce very different medusae. 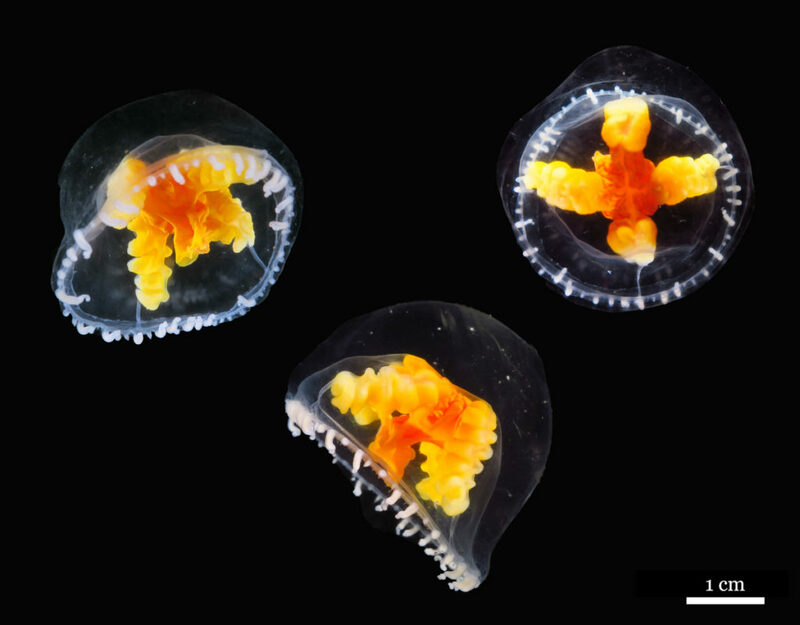 These beautiful medusae of Ptychogena crocea collected in Korsfjord were sexually mature. 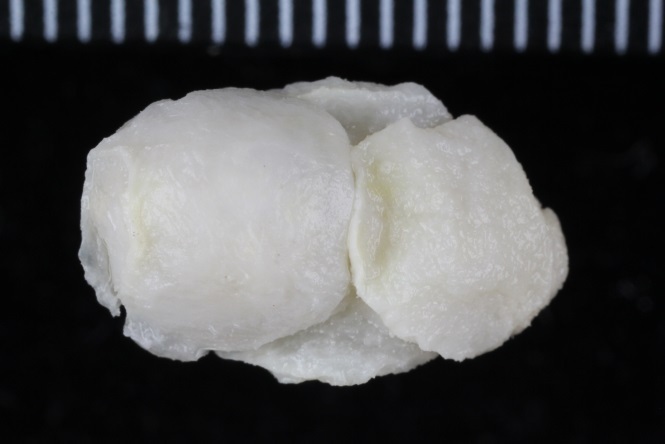 You can see the four gonads as folded masses of yellow tissue in each jellyfish. Thus, this was the objective of my recent visit to the Bergen University Museum. 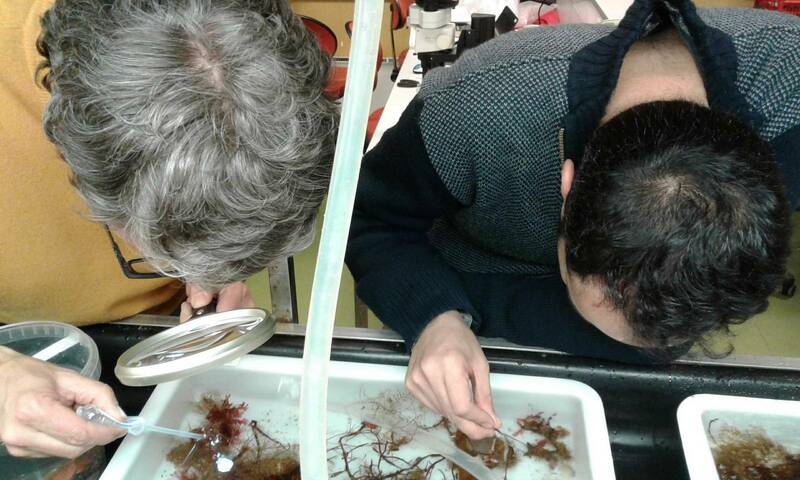 An outstanding month surrounded by enthusiastic scientists, amazing landscapes, restricted doses of sun, and upcoming challenges: we trust that current and future analyses combining both molecular and morphological taxonomy will lead to settle the correspondence of Stegopoma hydroids with other Ptychogena-like medusae from all over the globe, or even to the description of new species to science! 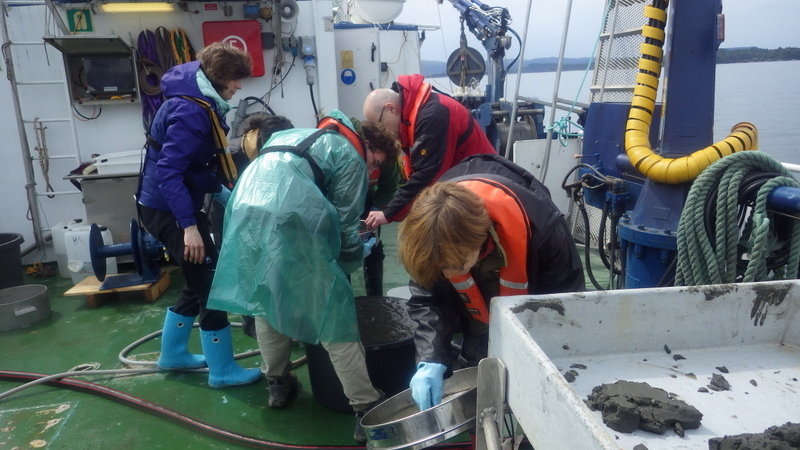 Team-work during the sampling makes everything a lot easier! 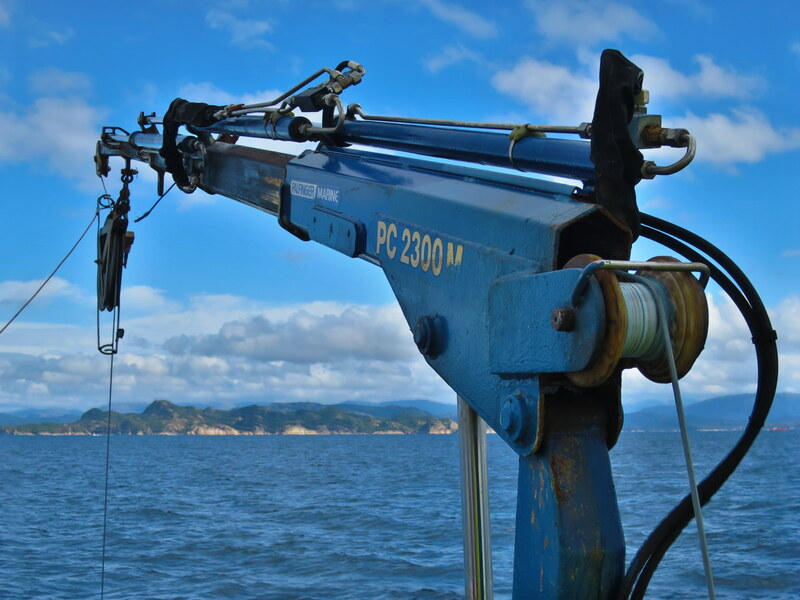 The amazing crane of the RV “Hans Brattstrøm” allowed us to efficiently hunt for jellyfish at the fjords. This entry was posted in Current projects, Guests, HYPNO, NorBOL, Norwegian Taxonomy Initiative, Photography on September 26, 2017 by katrine. Professor Wolfgang Wranik from the University of Rostock in Germany has visited the Natural History Museum during the 13-14th of June to work on a recently detected invasion of an American species of haminoid gastropods observed in southern Scandinavia and the western Baltic Sea. 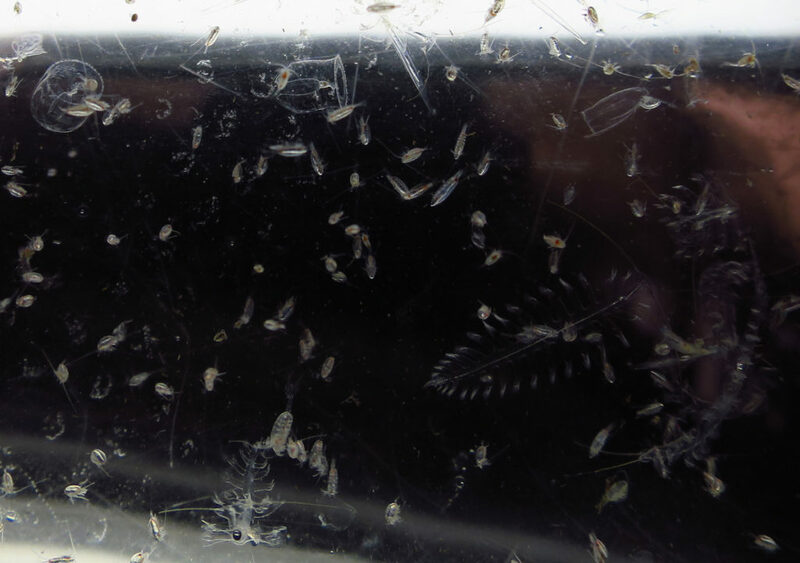 The species is apparently already reproducing and established in the area, but it is unknown when and how did it make is way across the Atlantic. 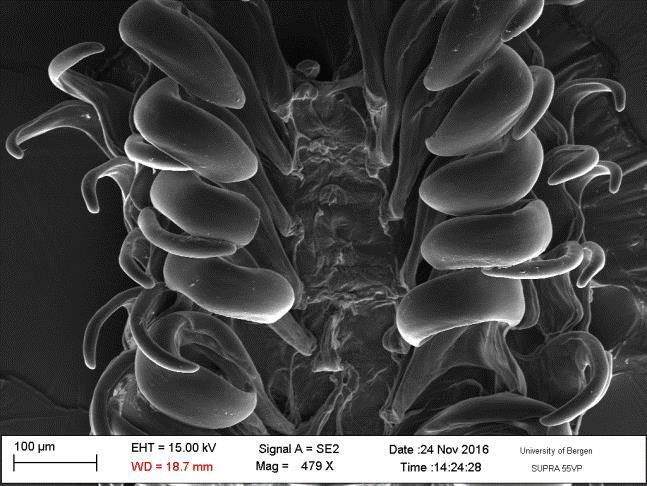 A combination of DNA and fine morphological data using scanning electron microscopy is being employed to compare specimens from both side of the Atlantic and confirm the identity of the European specimens. 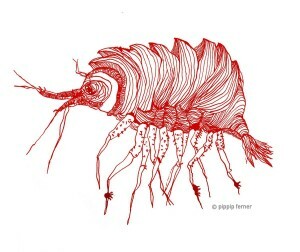 Animal from Tjärnö, Sweden observed in January 2017. 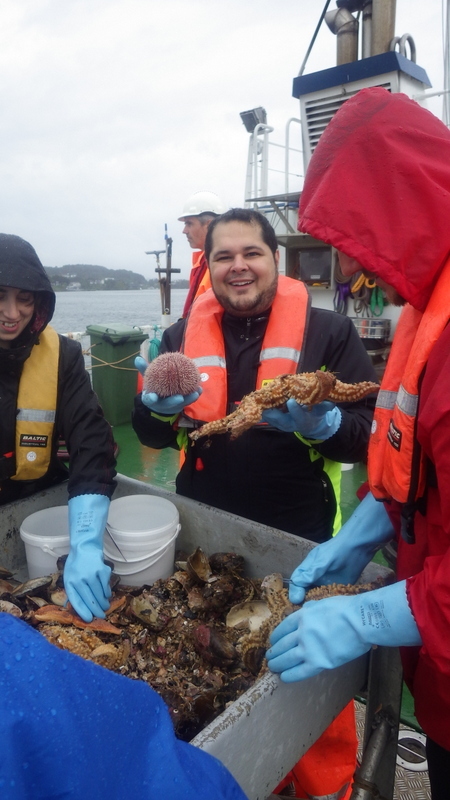 Global warming is facilitating the spread of southern species into higher latitudes, and the role of shipping and aquaculture activities in re-shaping the distribution of many marine species is well documented. 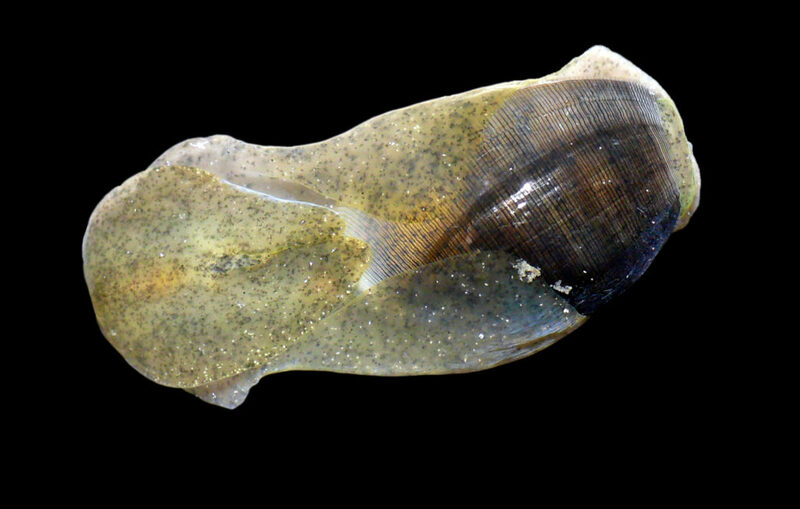 Among haminoids there is fear that a Pacific species established in the Mediterranean Sea since the 1990s (Haminoea japonica) is already displacing the native fauna of molluscs, which raises concerns about the possible impact of the US haminoid in our local environments. 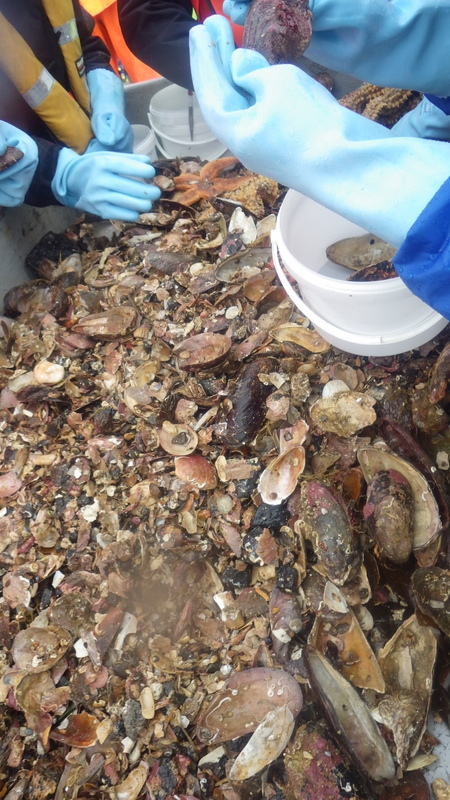 This entry was posted in Current projects, Guests and tagged climate change, distribution range, Haminoidea, invasive species, Mollusca on June 20, 2017 by katrine. 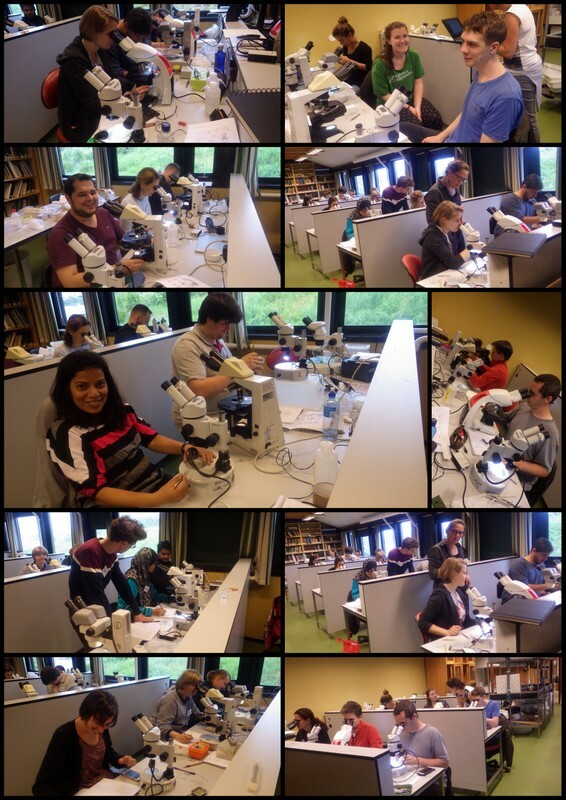 The days are pretty packed, with lectures, sampling, and lab work – thankfully both students and teachers are enjoying the work, and the mood in the lab is sunny (even if the Bergen “summer” is somewhat…fickle these days). 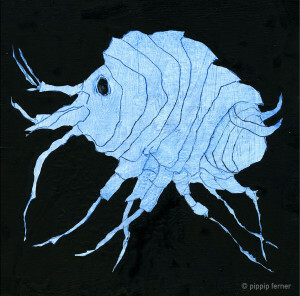 We have covered a multitude of research topics, methods, habitats, and annelid groups so far, with still more to come. 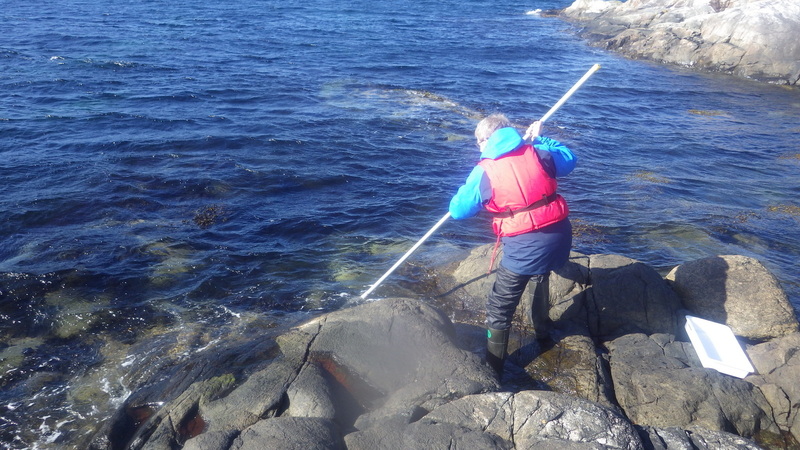 “summer” sampling – we did get very nice samples! 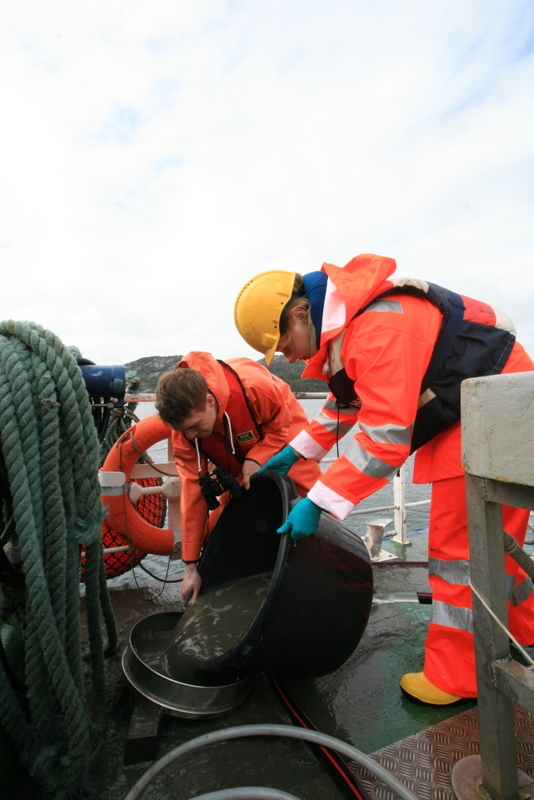 Protocol for the proper washing of samples – good skills to learn! We’ll keep blogging from the from the course, so check back! 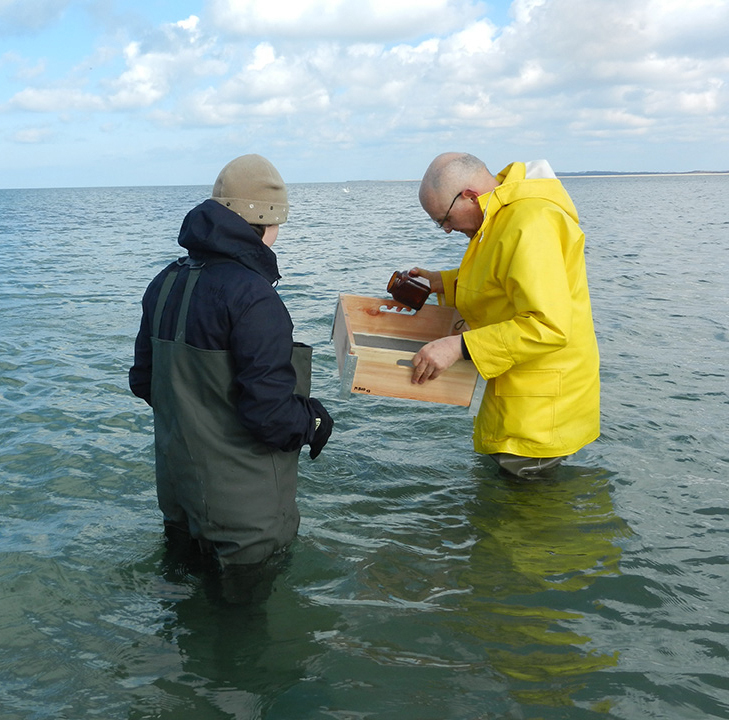 You can also get some glimpses of the exciting world of Worm researchers (!) by checking the tag #annelidacourse2017 on Twitter (you don’t need an account to do that, just click the link). 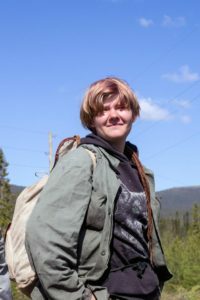 This entry was posted in Current projects, Field work, Guests, Photography, Student Projects, Workshops and tagged Annalida, Annelid Systematics, Morphology and Evolution on June 13, 2017 by katrine. 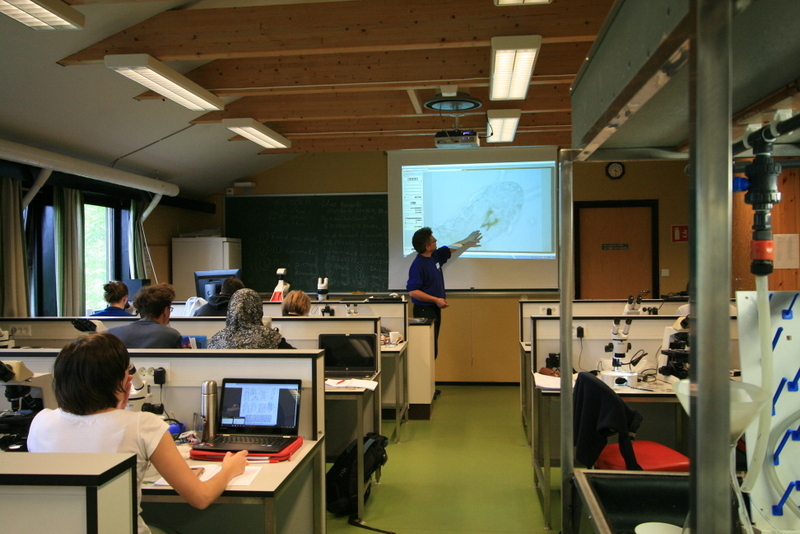 The two-week long International Course on Annelid Systematics, Morphology and Evolution is up and running at the Espegrend Marine Biological Station! 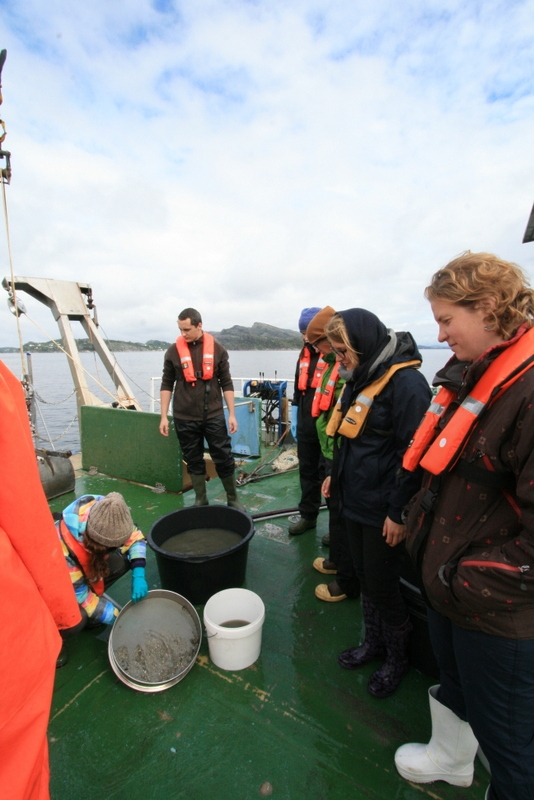 The course is held by the University Museum of Bergen in cooperation with the Moscow State University and ForBio (Research School in Biosystematics). It is sponsored by SPIRE (Strategic Programme for International Research and Education) and SIU (Norwegian Centre for International Cooperation in Education). More info about the course can be found here. 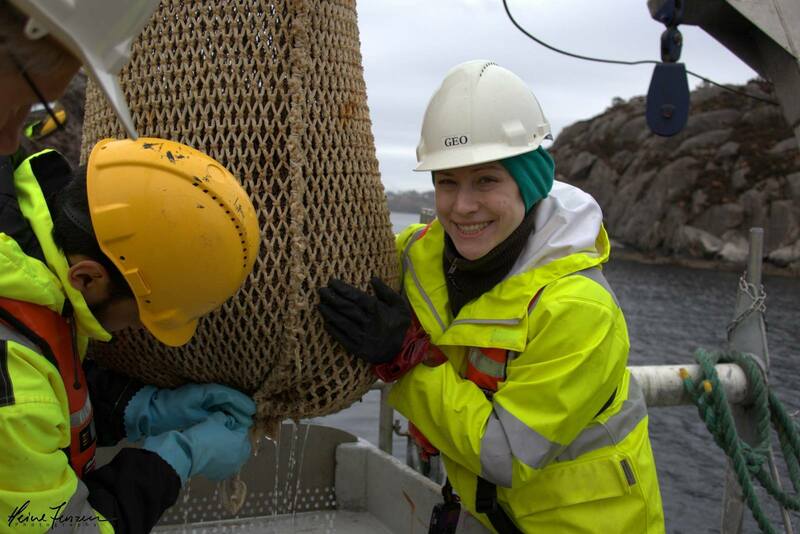 Twenty students and eighteen course organizers and instructors from Norway, Russia and 10 more countries are participating in the course, which is being held in the University of Bergen’s marine research station at Espegrend. 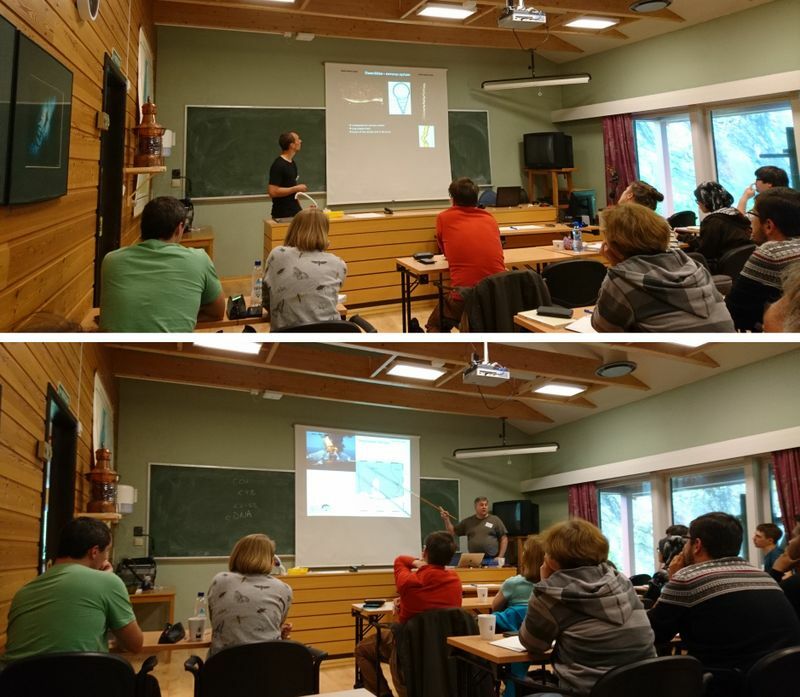 The course has started with a lecture on basic concepts in phylogenetics and evolution following by Endre Willassen, followed by the talks on phylogeny of Annelida by Ken Halanych (Auburn University) and Conrad Helm (Sars Centre). We have been samplingwith both R/V Hans Brattstrøm and the smaller boat Aurelia in several benthic biotopes in the vicinity of the station, and have collected plenty of serpulids and siboglinids among other worm families. 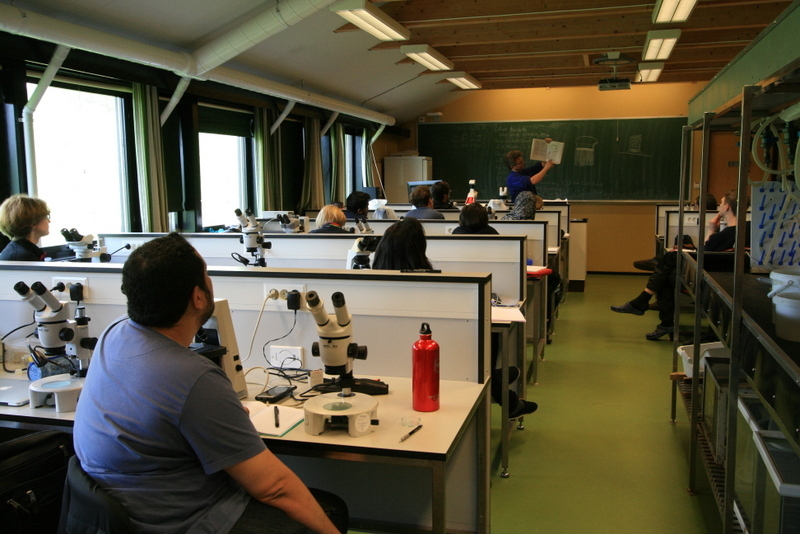 The first laboratory session focused on Sabellida and Siboglinidae and were taught by Maria Capa (NTNU), Nadya Rimskaya-Korsakova (MSU) and Glafira Kolbasova (MSU). 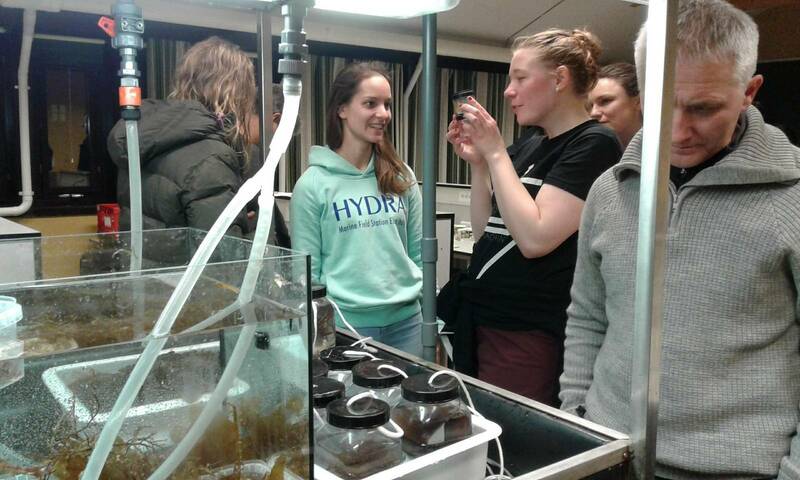 Nadya has brought few large vestimentiferans from the Moscow collection and the students got the opportunity to look at famous hydrothermal vent tubeworms. 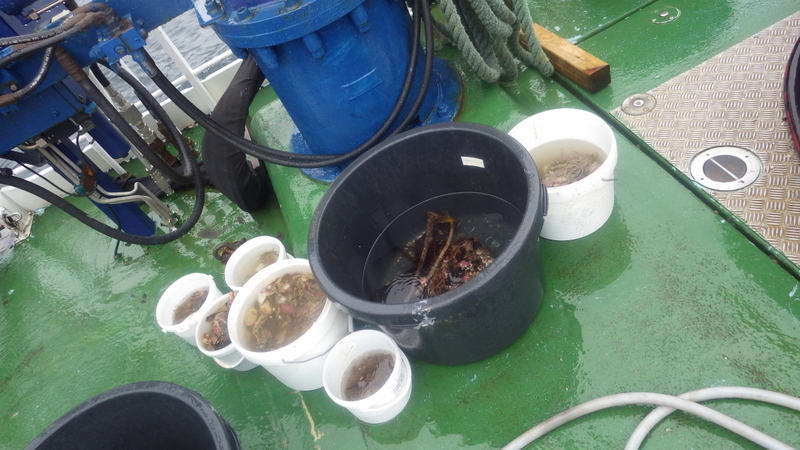 Samples-both fixated specimens brought from Russia, and live ones caught locally – the live specimens are stored in the cold room , and we suffer a little when we og to get them..! We’ll be blogging more from the from the course, so check back! You can also get some glimpses of the exciting world of Worm researchers by checking the tag #annelidacourse2017 on Twitter. 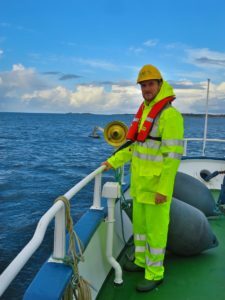 This entry was posted in About, Current projects, Field work, Guests, Workshops on June 8, 2017 by katrine. 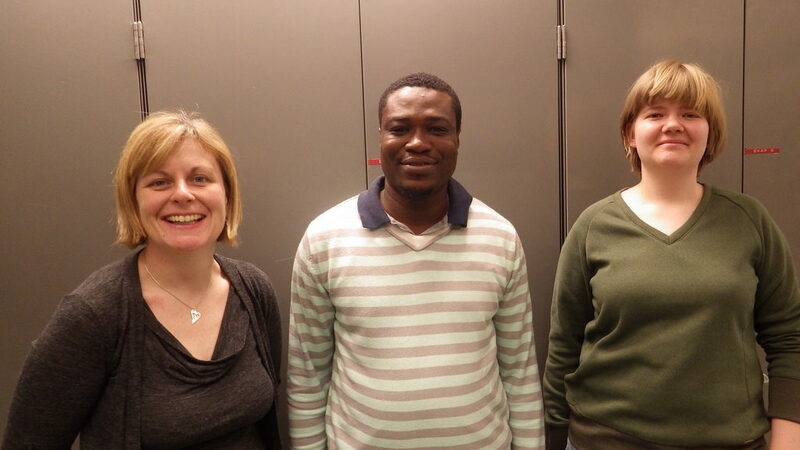 The lab is teeming with guest researchers these days, as we have these three lovely polychaetologists visiting to work on the MIWA (Marine Invertebrates of Western Africa)-material. 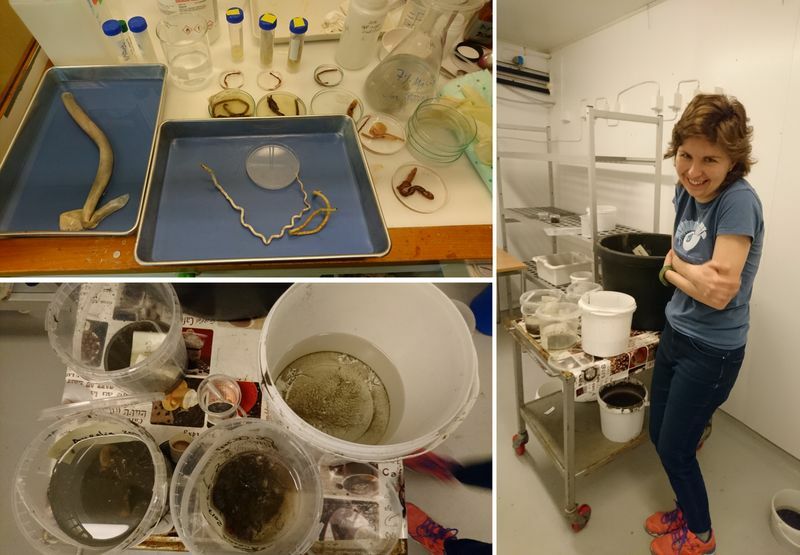 Kate is working on the polychete family Magelonidae, and has written a blog post about her stay. 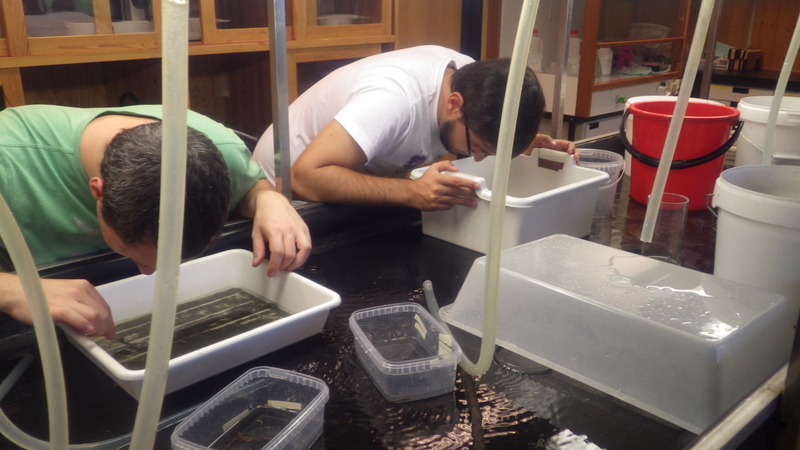 Lloyd is working on the families Glyceridae and Goniadidae, and Polina is doing her MSc thesis on the Lumbrineridae. You can find short project descriptions of these (and many of our other) polychate projects here. Makes sure to check by our MIWA-blog for more updates in the time to come! 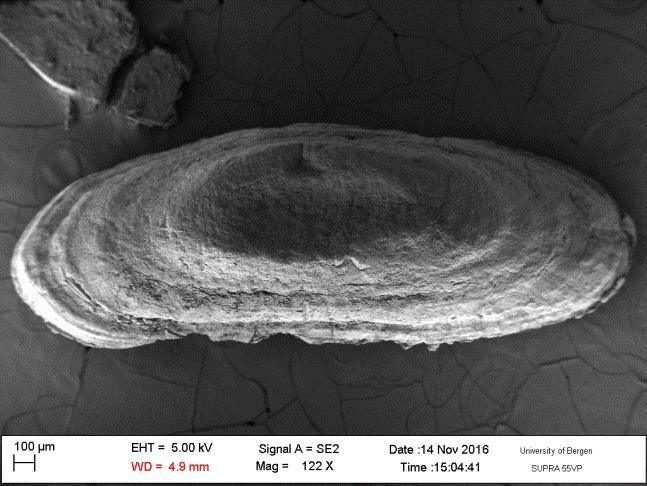 This entry was posted in Current projects, Guests, Marine Biodiversity of West Africa, Student Projects on January 27, 2017 by katrine. 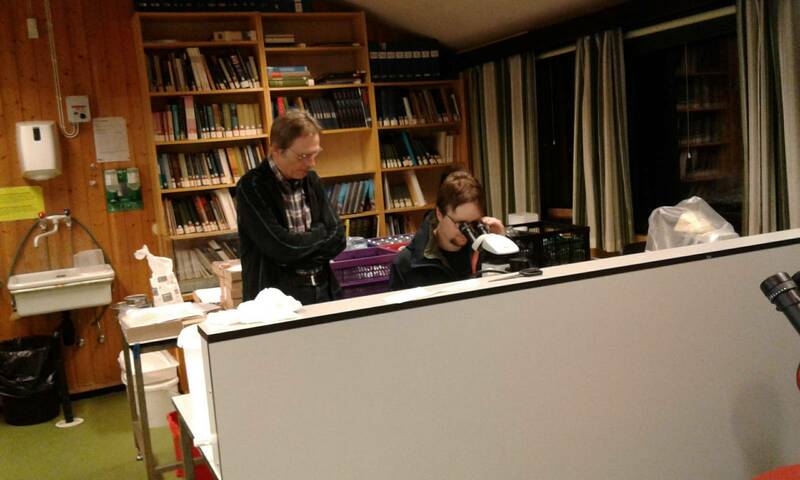 Polina Borisova, a first year master student from the Zoological Department of the Moscow State University (Russia), is coming to the Invertebrate Collections of the University Museum of Bergen with a 1-month research visit in January 2017. Polina is going to work on the bristle worms from the family Lumbrineridae studying the collection from West Africa and Norway. Her project is jointly supervised by Dr. Nataliya Budaeva from the University Museum of Bergen and Dr. Alexander Tzetlin from the Moscow University. 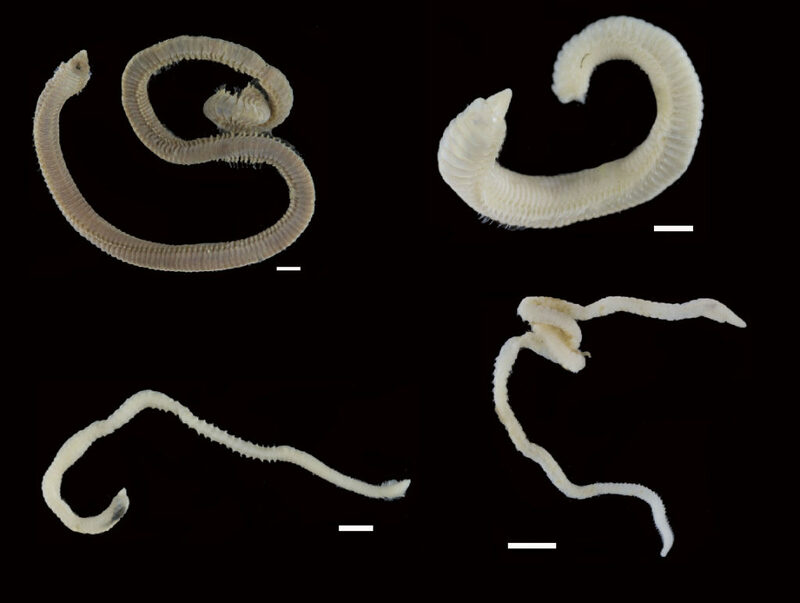 Various Lumbrineridae from West Africa, scale 1 mm (Photos from BOLD). 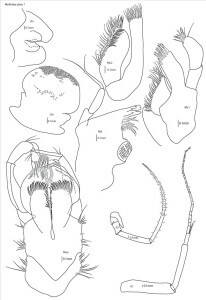 Lumbrineridae are the worms with relatively poor external morphology but complex jaw apparatus. The structure of jaws has been traditionally used in the systematics of the family in the generic diagnoses. 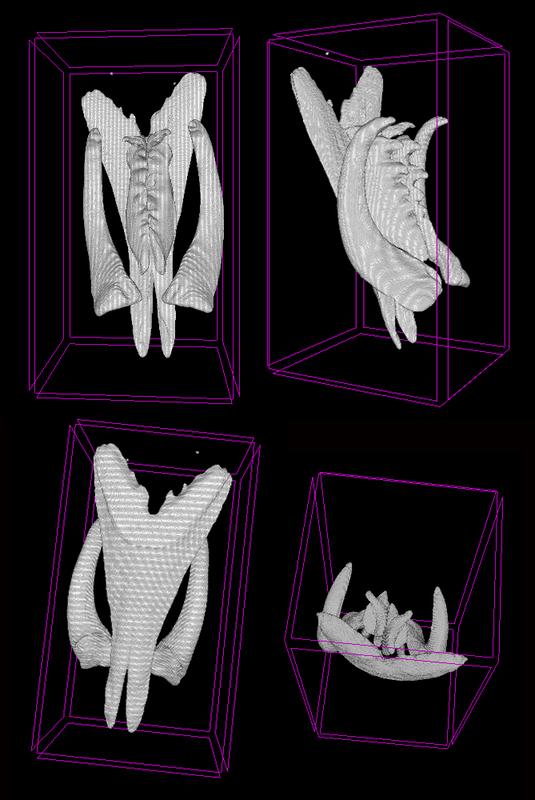 Polina is utilizing the methods of microCT to study the jaws of lumbrinerids in 3D. Polina is also going to sequence several genetic markers to reconstruct the first molecular phylogeny of the family. 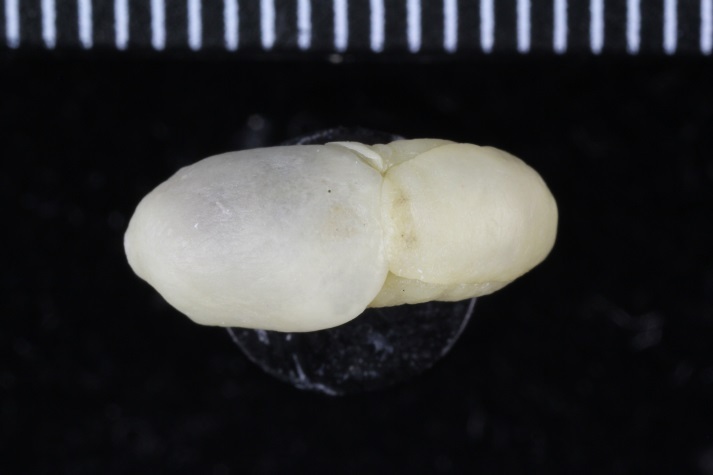 This will allow testing the current hypothesis on the intergeneric relationships within Lumbrineridae and will aid in tracing the evolution of jaws within the family. This entry was posted in 2016 december calendar, About, Current projects, Guests, Marine Biodiversity of West Africa, Photography, Phylogenetics, Student Projects and tagged jaws, lumbineridae, MicroCT on December 17, 2016 by katrine. During my stay at the University Museum of Bergen I have been working on the diversity and systematics of Antarctic philine snails. 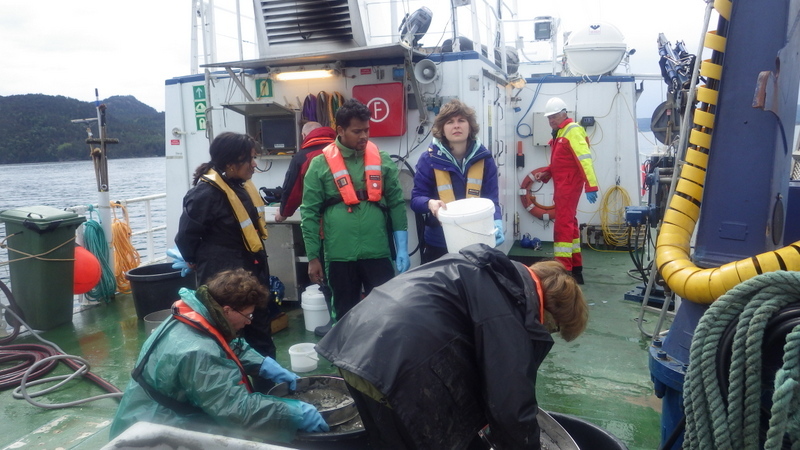 Most of the samples were collected during different cruises on board of the RV Polarstern in the Eastern Weddell Sea, Bouvet Island, and South Shetland Islands (West Antarctica). I photographed all specimens and then clipped them for the DNA analysis (see pictures). I was able to work at the DNA lab with excellent resources for DNA extraction, amplification, purification, and sequencing. I am indebted to Louise Lindblom who helped me at the beginning of my crusade there. 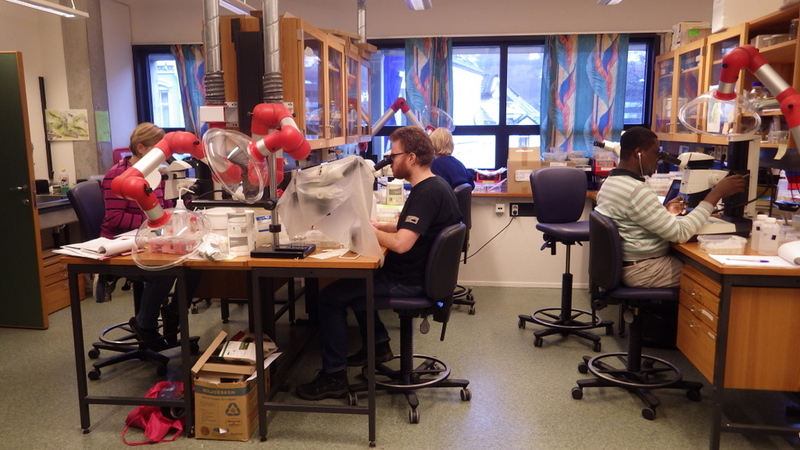 After a first barcoding of all the material we identified six clades, from which we selected a maximum of three specimens to further sequence the ribosomal genes 16S and 28S and the nuclear gene codifying for the Histone 3. The first phylogenetic tree with all partitions resulted in the finding of novel clades that now deserve further investigation. Moreover, I was able to join the student diving club and make several dives to get to know the local flora and fauna. 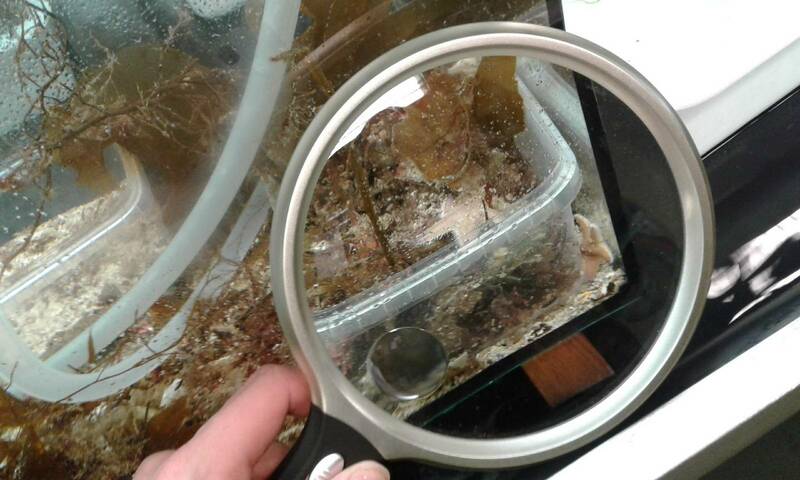 I could even collect some other heterobranch slugs for the barcoding project of the museum. 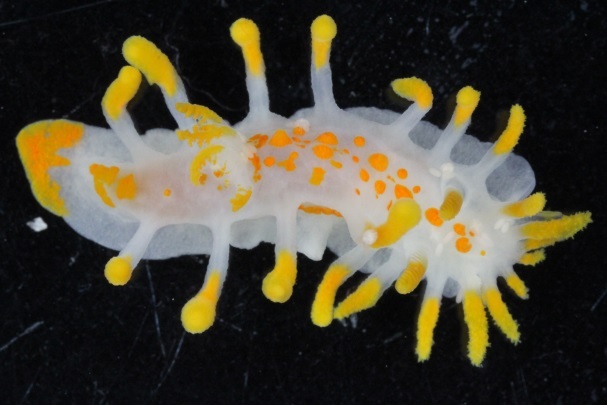 See a couple of pictures of the nudibranch Limacia clavigera and Onchidoris muricata. Overall, Bergen is a nice city to visit surrounded by nice mountains, good (but not cheap) beers, beautiful fjords, and nice people. 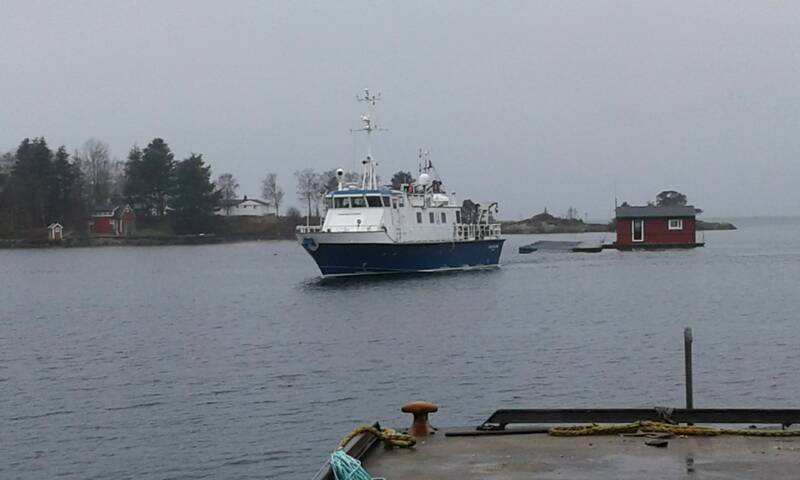 I hope I can come back with a postdoctoral position to further enjoy the country and meet more Viking descendants. 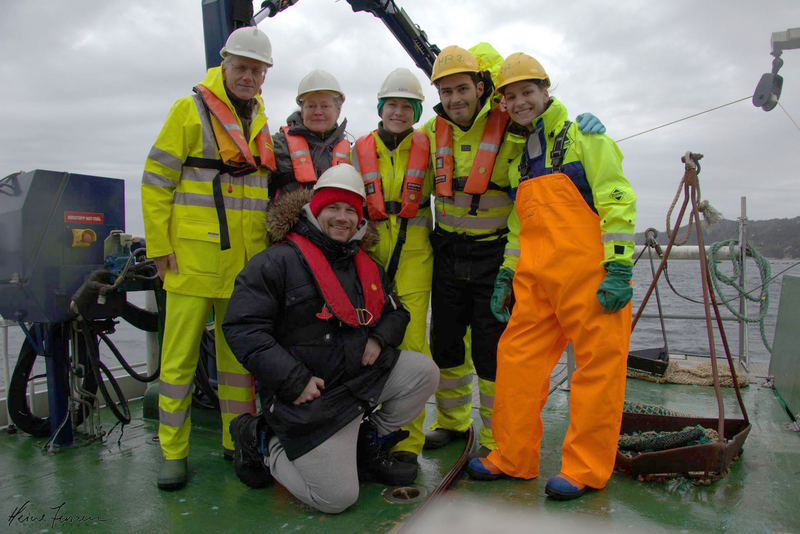 This entry was posted in 2016 december calendar, Current projects, Field work, Guests, Student Projects and tagged guest researcher, Mollusca, Philine on December 9, 2016 by katrine. A week of worms in Wales! Does that not sound appealing? It was actually a lovely event! 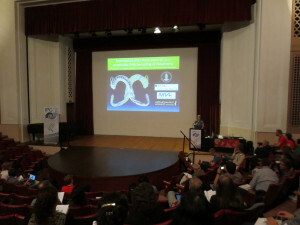 The 12th International Polychaete Conference took place in Cardiff, Wales during the first week of August. These events have been taking place every third year since 1981, and the previous one was in Sydney, Australia in 2013. 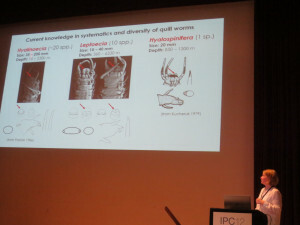 During an intensive week of presentations and posters spanning topics within Systematics, Phylogeny, Ecology, Methodologies, Biodiversity, Biodiversity and Ecology, Morphology, Reproduction & Larval Ecology, Development, and Polychaete studies, people had the chance to showcase their work, and learn more about what others are working on. The local organising committee invited us to “Have a happy conference, re-connecting with those already known, meeting correspondents for the first time, ans making new connections and new friends” – and I think we can safely say that the mission was accomplished! 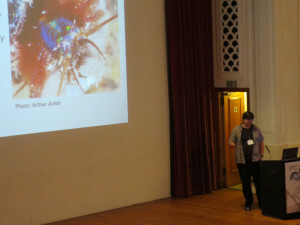 Cardiff – and the National Museum Wales – was an excellent venue for “polychaetologists” from all over the globe. 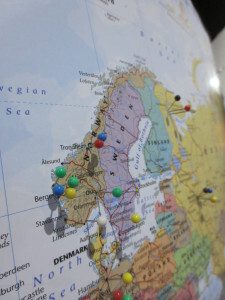 In all we were 190 attendees from about 30 countries present – including a sizeable Norwegian group! Some of us (below) gave talks, and most were also involved in posters. 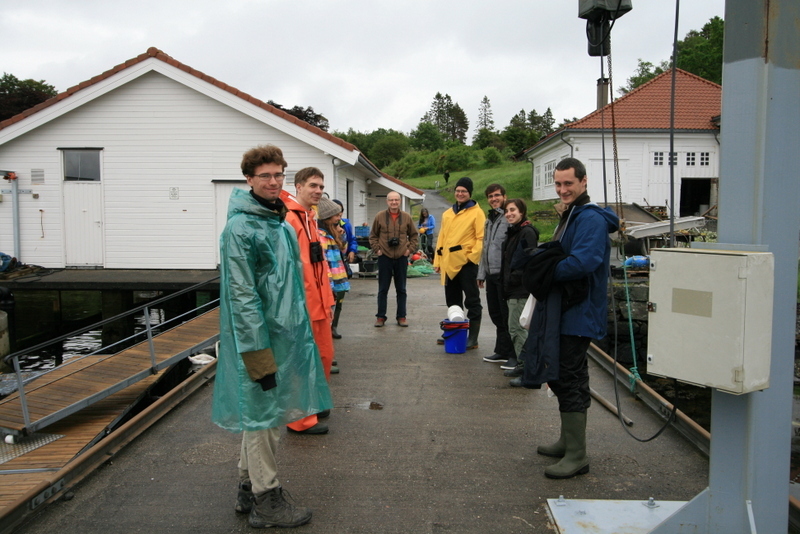 Results and material from large projects and surveys such as PolyNor (Polychaete diversity in Nordic Seas), MAREANO (Marine AREA database for NOrwegian waters), NorBOL (The Norwegian Barcode of Life), and MIWA (Marine Invertebrates of West Africa) were all well incorporated in the Norwegian contributions. 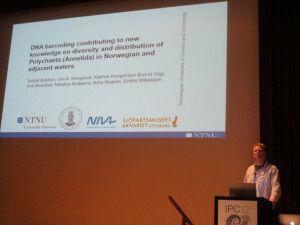 There were in fact a lot of contributions involving one or more collaborators from a Norwegian institution (UM, NTNU, NIVA, The SARS center, NHM Oslo, Akvaplan-NIVA ++) being presented during the conference. 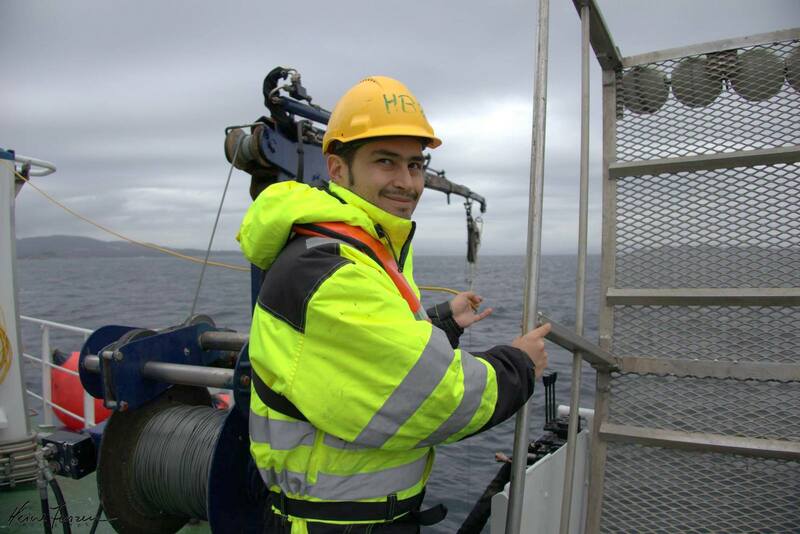 It is really nice to see that the community is growing through recruitment of both students and international researchers. Pins marking where participants come from – this was not quite completed when the photo was taken, but none the less..well represented! 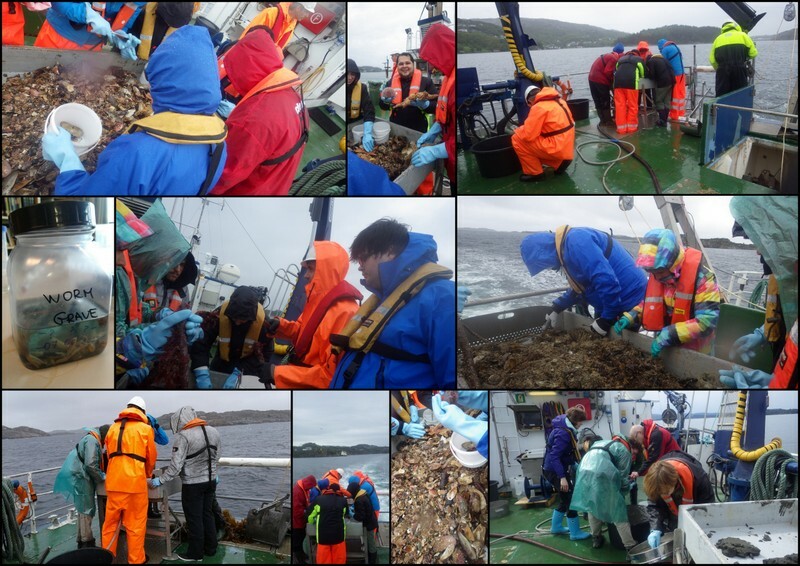 With so many active participants in the field, a lot of exciting research is being carried out in Norway. 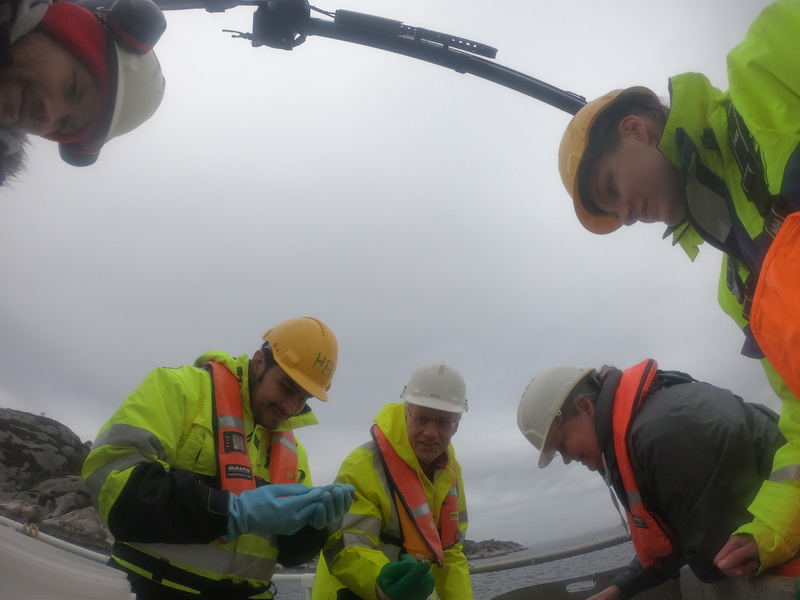 Not only do we have many projects – large and small – running at our institutions involving our “regular” Norwegian collaborators; there is also a significant proportion of international participation in these projects. 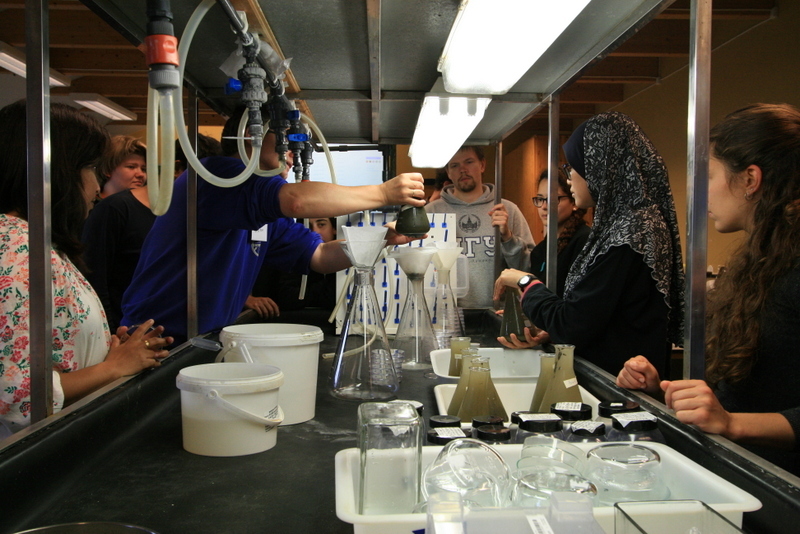 Furthermore, our activities enable researchers from all over the world to visit or loan from our scientific collections, and study the substantial (new) material that the projects are generating. It is nice to see that our efforts are being recognized in the international community! 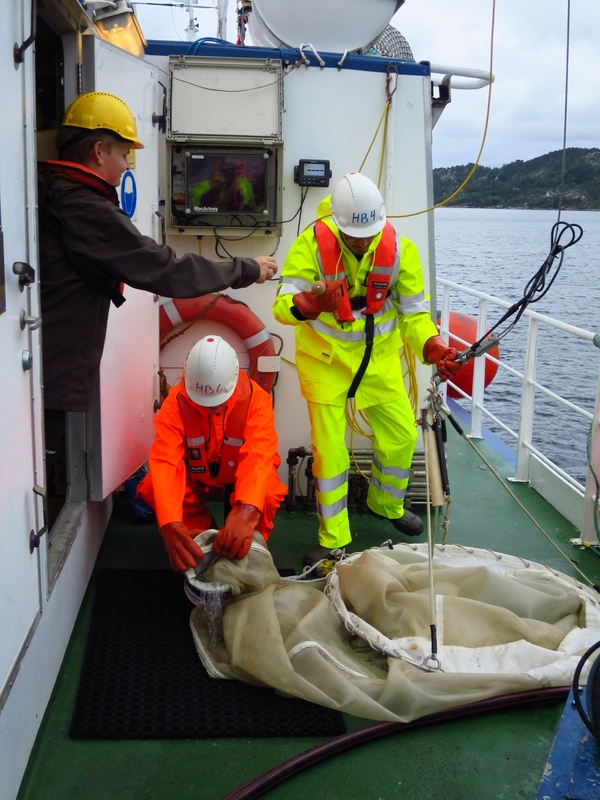 The recent flurry of activities has been well aided by the Norwegian Species Initiative (Artsprosjektet) (and the MIWA-project at UM). 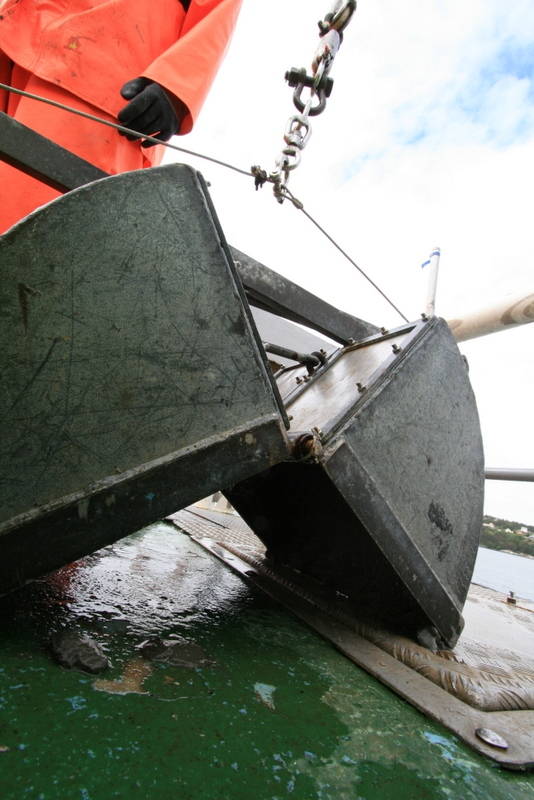 The majority of our research is based on, or incorporates, museum material from our collections. The collections have been built over years, decades and even centuries, and continue to increase in scientific value as new science is added. It is gratifying to see the material being used, and we hope it will gain even more attention in the aftermath of the conference. The University Museum was well represented, both in attendance, and in contributions. Below is a list of what we (co-)authored, presenting author is in bold, and University Museum people are in italics. We plan on posting some of the posters here, so stay tuned for that! We had a mid-week excursion where we got to see a bit more of our hosting country; namely the impressive Caerphilly Castle constructed in the 13th century and still looking magnificent today, and a lovely lunch at the Llanerch wineyard with time for informal mingling and catching up. Note the red dragon in the Castle wall; this is the dragon of the Welsh flag. The story goes something like this (according to Wikipedia, at least! ): From the Historia Brittonum, written around 830 a text describes a struggle between two serpents deep underground, which prevents King Vortigern from building a stronghold. This story was later adapted into a prophecy made by the wizard Myrddin (or Merlin) of a long fight between a red dragon and a white dragon. According to the prophecy, the white dragon, representing the Saxons, would at first dominate but eventually the red dragon, symbolising the Britons, would be victorious. Being museum people (er..? People employed at a museum, I mean!) ourselves, we made sure to visit the exhibitions as well, and especially the new “Wriggle!” exhibition, which is all about..worms! Lots of fun, and a*a lot* of information packed in. Make sure to visit it, if you get the chance! Finally, we would like to extend our heartfelt thanks to the arranging committee – DIOLCH! ps: Dw i’n hoffi mwydod! 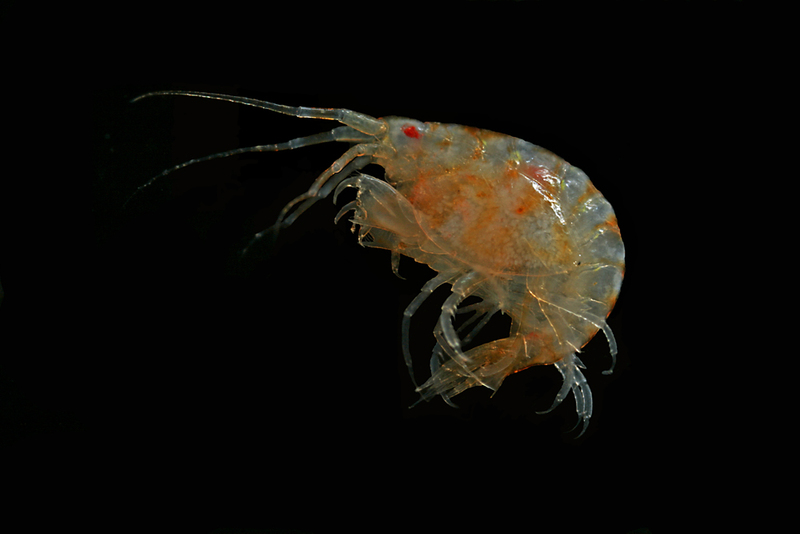 This entry was posted in About, Conference, Current projects, Guests, MAREANO, Marine Biodiversity of West Africa, NorBOL, Photography, Phylogenetics, PolyNor, Student Projects and tagged IPC12Cardiff, IPC2016, polychaeta on August 16, 2016 by katrine.